So this is where it all began! Our first studio was situated in Broadhempston. We shared our space with Slades Stitchery, a fellow crafter. Did we mention they kept two Alpaca’s? This is where we got our name Alpaca Print! 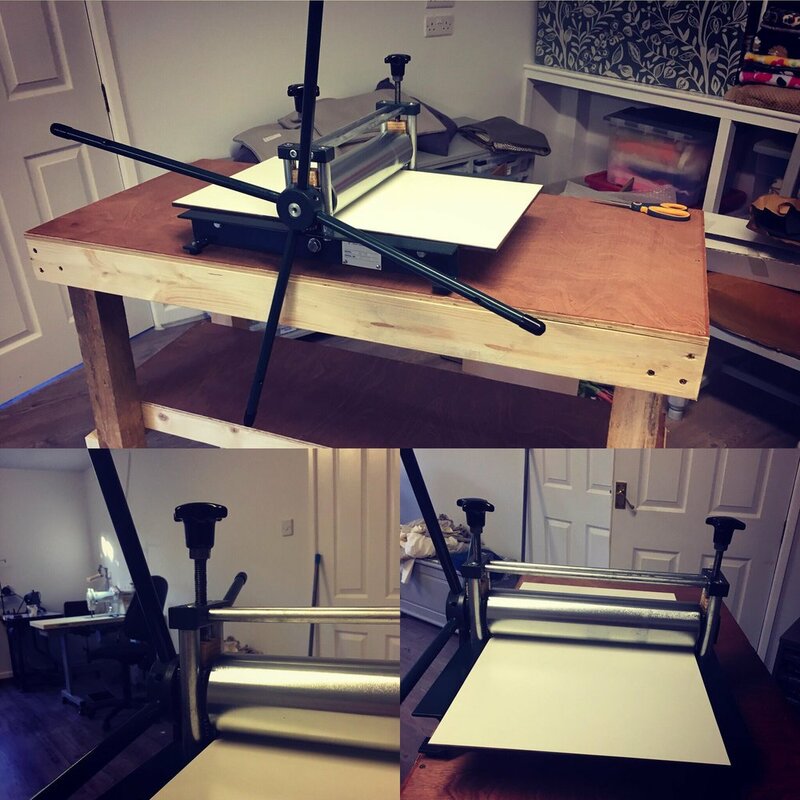 Yes, this our beautiful etching press, which we are able to move about, so we can do our printing workshops near you! We love a good craft fair! 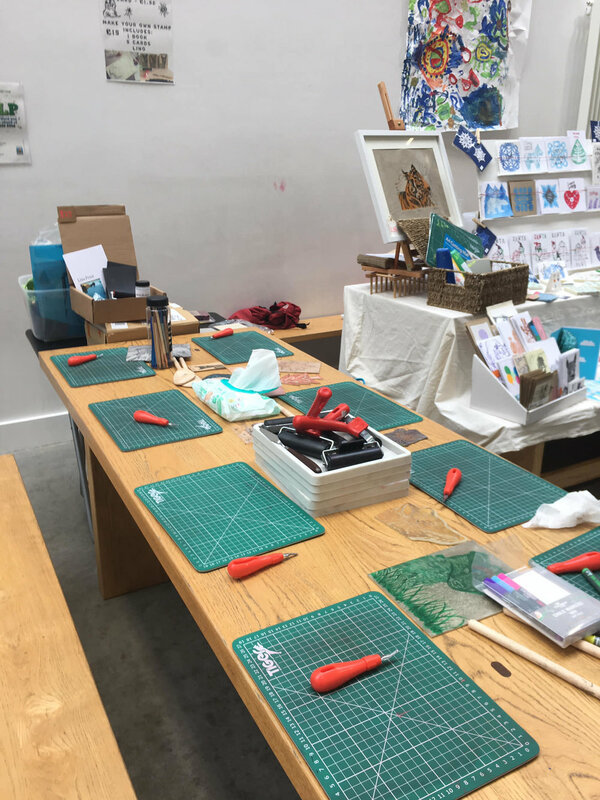 It gives us the opportunity to showcase all our work to you and it is a great opportunity for you to sign up to our workshops. Mono print / Lino print which has then been printed onto an old music sheet. Example of a card we sell at craft fairs. This silver fox is printed in lino. Was great to see everyone at the show. We had so much fun meeting so many people! We spent the show creating lots of great work and sharing our experiences with many other crafters. Paper making is something we like to do using all our paper we no longer need. We believe passionately in recycling and being kind to our planet. If you have questions about paper making then get in touch! We really enjoy paper making! We just wish there was more hours in the day to do more. Here is our deckle and mould. We really enjoy supporting Hayles Keary in Tiverton and her group of young crafters called ‘Busy Bees’. 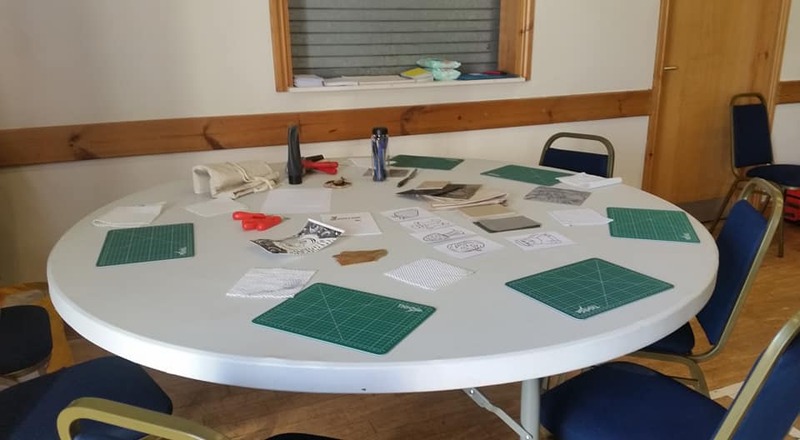 Here we are all set up and ready to teach Lino printing. Hand Printed Calico material, printed with a lino print and hand-sewn by our very own Kate. Kate has been experimenting with surface pattern design and made these really cool purses that we sell at craft fairs.